**Gift card provided in exchange for this post. All thoughts are 100% my own. That's not something we really want to talk about as Christians is it? After all, we have this idea that if our faith is strong, there leaves no room for doubt! When we admit that we have doubts, does that mean that we are not good Christians? Let's take a look at the definition of doubt, which states doubt is, ' a feeling of uncertainty or lack of conviction' or to 'feel uncertain about, fear; be afraid of.'. Now, I don't know about you, but I consider myself to be a strong Christian, a person with a lot of faith... but can I say I've never had my doubts? No, I cannot. I've never doubted the existence of God, that I've always been certain of. But other scriptures that I know by heart and truly do believe, sometimes in the midst of hard times it's hard to fully embrace them. One of my very favorite verses is Jeremiah 29:11: "For I know the plans I have for you, "declares the Lord, “plans to prosper you and not to harm you, plans to give you hope and a future." I know these words by heart, and often find myself repeating them over and over when things are not going according to my plans. And in my life, that has happened often. Even having seen that this is true in my own life, seeing good come from less than ideal situations... when I'm mid crisis, it's hard to believe it. When your health is failing, when a loved one dies unexpectedly, when your spouse loses their job...where is the GOOD in that? How is this God's plan for my life? Doubt in and of itself does not make us a bad Christian... it simply makes us human. It is what we do with that doubt that can either separate us in our relationship with God, or strengthen it. For me, I use those moments to bring my relationship strength. I pray about it. I dig deeper into the Word- I look at the story of Thomas, I look at other scriptures relevant to my struggles. I am a stronger Christian because of my doubts, because they have forced me to dig deeper. The second season premiers Sunday, March 5th, and I for one am looking forward to experiencing it for myself! Will you be watching? 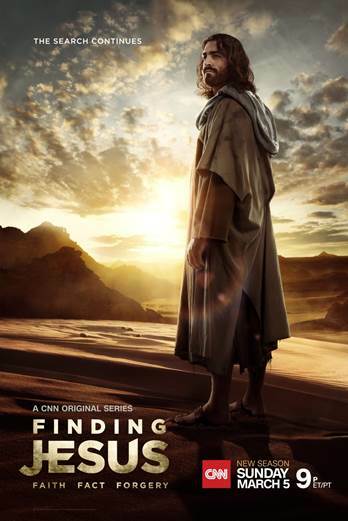 Don't forget: Season 2 of Finding Jesus: Faith, Fact Forgery premieres Sunday, March 5 at 9 PM ET/PT on CNN. Oooh I will have to catch up on this!! I have never heard of it but I am so intrigued!! I'm really excited to watch this, first time I've heard of it. I'd love to watch this show! This show looks great! I'll have to check it out with my family! !